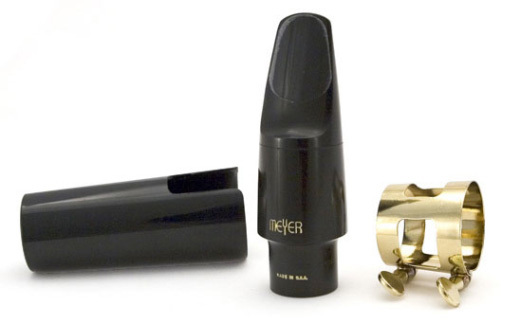 Meyer is one of the finest lines of hard rubber and metal mouthpieces available. Meyer ebonite mouthpieces can be played by almost anyone, making them a great choice for players at every level. Choose ebonite in soprano, alto, tenor or baritone; metal in alto, tenor jazz or tenor with amazing playing response and smoothness of tone, these mouthpieces stand alone. Great mouthpiece, I have used this model for many years. The graded lay provides a full and rich tone. The mid sized 5M suites all styles of playing. After using a Selmer Jazz metal mouthpiece, which has a great sound, I found the Meyer more manageable - probably because my usual instrument is a baritone and I find the alto difficult! As a developing player (mainly jazz & blues) my teacher recommended an upgrade from my Yamaha 4C. Spent a morning with Dawkes playing various pieces and settled on the Meyer. Lovely tone, warm and mellow but with a hard edged growl when you want it. Still learning how to get the best from it but when I hit the sweet spot it sounds great. I purchased a 7M Meyer M/piece from Dawkes in April '10. I had been using a Lawton 7 star B since the 1970s but the passage of years had made it eventually, unusable. I purchased the Meyer on Dawkes advice and it has given me a new lease of life. The tone suits me and it is untiring to use. I would highly recommend it - From low B to top F#. I recently switched to Meyer 7M from an Otto Link 7* HR. The lay is smaller, so altissimo at times is harder to achieve. But the dynamic range, brightness, sweetness, clarity of tone and overall playability is far better. It's a great piece and I'm glad I bought it from Dawkes.